On Tuesday, February 3, 2009, "Storm the Bastille" will celebrate its 2nd anniversary of bike rides to the City's Bicycle Advisory Committee, all the while banging the drum and fighting for an open and inclusive process for bike advocacy and fighting for the reorganization of the long dormant and ineffective BAC. It was a long and arduous journey but along the way the City Council responded to the clamor. The Transportation Committee and the Planning and Land Use Committee intervened, resulting in an action that reorganized the BAC and directed departments from Planning to Rec & Parks to Public Works to the City Attorney's office to assign and direct staff to support the efforts of the "new" BAC. Along the way, Paul Meshkin was named as the new head of the LADOT Bikeways Engineering Group. Paul is returning to Bikeway's and to this position and we are optimistic that the City Council directed reorganization and his leadership will result in a successful LABAC. Attached is a copy of a letter I submitted to Paul this week. Congratulations on your tour of duty as the head of the LADOT Bikeways Engineering Group. I hope you are successful in revitalizing the department and I look forward to working with you. 1) The City of Los Angeles has an early notification system in place so that members of the community can simply sign up and then receive an email with the agendas of the City Council, the Council Committees, the Commissions etc. I realize that the LA Bicycle Advisory Committee has a long tradition of using the US Postal Service in order to deliver little packets of printed matter including agendas and clippings but those days are so long gone. We have a new president, he twitters and the time has come for the City of Los Angeles and the BAC to join the revolution. Please, take advantage of the technology and let's start communicating effectively and let's truly engage the public in the business of the Los Angeles Bicycle Advisory Committee. 2) The City of Los Angeles has property throughout the City. There is no reason to continue to use the cold and inhospitable Parker Center auditorium unless your real objective is to alienate the public in an environment that is best suited for catching pneumonia. The simple standard for a meeting place is that it is accessible on foot, by bike and by mass transit. There are many facilities that fit the bill and we have had the conversation before. If the location choice is made based on what suits the staff of the LADOT best, then you are simply demonstrating that the BAC belongs to the LADOT and not the people of Los Angeles, a charge that has been leveled in the past. Please, pick a new location for the LABAC meetings. While you're at it, get the committee meetings out of the LADOT offices and hold them in the evenings when the public might actually attend them. Put the public first and watch the BAC actually become an effective advisory body. 3) The City of Los Angeles has a Bikeways department but the LABAC seems confused as to where bikeways facilities come from and how they appear. Perhaps now would be a good time for the Bikeways department to clarify its role, its function, its responsibilities in the grand scheme of things. Many on the BAC are surprised to discover that the Bicycle Plan is a Planning document, part of the Transportation Element, a part of the General Plan. hence the need to keep Planning involved in the BAC business or visa versa. Please, clarify once and for all the many departments who have a piece of the streets and let the BAC know who does what and how it all works, or in many cases, doesn't work. 4) The City of Los Angeles is a big place with 6500 miles of streets. It would be great to have an idea of where we stand with regards to bikeways amenities and infrastructure. Especially since we are the advocates who are urging our elected officials, from local to federal, to support our communities in the development of robust transportation projects that truly revitalize and stimulate our communities. Yet we don't even know where we stand with regards to bikeways status, let alone performance and goals. Please, give us an inventory of the City's bikeways assets and a report on the progress that was made last year along with the goals of this upcoming year. It would seem that this would be the most basic of information, especially if we are to work together to change the world. "Where are we, what's going on and where are we going?" 5) The City of Los Angeles has almost 90 Neighborhood Councils, all of whom are filled with volunteers who operate under that same basic Brown Act, Conflict of Interest, Ethics standards as our City Council and Commissions. Somehow the NC's are able to function with some degree of success under these rules and regulations while the LABAC seems to flounder. The last meeting had the Brown Act getting abused while the Committee argued over how to make a motion. Please, bring in the City Attorney as the City Council has recommended, train the BAC in the Brown Act and then get serious about putting the debate over process to rest and let's get busy changing the world. 6) The City of Los Angeles, in its infinite wisdom, created the Bicycle Advisory Committee in 1973. Along the way, a Charter was adopted and it refers to an expectation that BAC members "regularly communicate in writing with their respective council member and staff as well as the Mayor's Office and staff." Copies of this correspondence was to be forwarded to the Bikeways Section of the LADOT. Please, make the BAC member reports for 2008 available as soon as possible. This goes a long way to determining where we are so that we can agree on where we want to go. In light of the upcoming agendized elections, it would seem that this small performance standard would also be of relevance as we evaluate candidates for Chair and Vice-Chair. 7) The BAC is an advisory body yet the bulk of the committee's activity seems to be listening to reports. The cycling community is regularly directed to the BAC by departments including the LAPD, the City Council, the Planning Department and the City Attorney when issues related to cycling in the city come up. To that end, it is imperative that the BAC get in the business of representing and of offering advice to the City of Los Angeles. In order to accomplish that, topics must come before the BAC before they are history. Everything from the Bicycle Plan workshops to the reorganization of the BAC seemed to take the BAC by surprise this past year. Please, put the agenda in the hands of the committee so that the public can get items on the agenda in a timely fashion. Whatever the process is, it must be open and transparent and it must be clearly articulated. The agenda is not a secret document developed behind closed doors. Items on the agenda must be for discussion and for action if the BAC is to truly become effective. 8) The City of Los Angeles is in the midst of updating the Bicycle Plan, a process that was to include two workshops that seemed to have fallen off the landscape. In fact, the entire plan seems to have disappeared off the radar. The civic engagement element is one of the most important elements of the process and the cycling community has been quite vocal about the poor outreach in the first four workshops. Under "NEW!" the LA bike plan website offers a summary of public input from April of '08. That's not really news and it's not really new. Please, communicate loudly and clearly the status of the Bicycle Plan and ensure that the outreach to the public will be more effective and inclusive than the first four sessions and the second two sessions that disappeared. 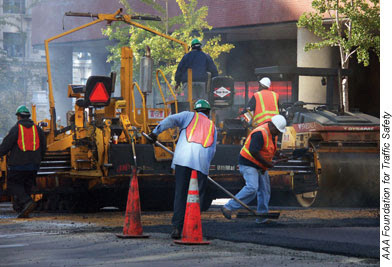 9) Streets are currently being resurfaced and striped. Western, Hollywood, Vermont, Edgemont are just some of those in Hollywood that have recently received a facelift. We're told that this is the best time for bikeways striping and yet...no bikeways improvements. Are the different departments talking to each other? Are the plans for bikeways improvements on hold? Are the priorities for the different departments our of sync? What happened to the promise of Sharrows? Please, reveal the immediate plans for the Sharrows in Hollywood and let's work together to make them happen. The upcoming "Storm the Bastille" ride on Tuesday, February 3, 2009 will be our two year anniversary! We've been riding to the LABAC meetings and banging the drum, all the while hoping that the BAC would become an open and inclusive and effective body, committed to supporting cyclists and improving the quality of life in Los Angeles. 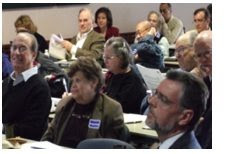 The Department of Neighborhood Empowerment convened the first of three NC Town Halls this past Saturday, drawing approximately 50 community leaders to the Valley Civic Center for a session that was heavy on speakers but light on content. Rita Robinson, GM of the Department of Transportation, was the headliner and her casual style drew positive comments from the audience. Dismissing pessimists and optimists alike, Robinson urged the community to partner with her as realists saying "We are a city in crisis, we are a nation in crisis, but it's also a time of great opportunity. Our challenge is figuring a way to work together to put our money to the best use possible." Robinson opened the room up for public comment and literally the entire room rose, causing traffic jams at both microphones. NC reps immediately went local, very local, addressing specifics to their neighborhoods that demonstrated the huge chasm between City Hall's high-altitude bombing approach to transportation and the reality on the streets. A pastor of local church spoke of a 20% reduction in attendance as a result of the recent adjustment in parking policies in his neighborhood, eliciting from Robinson, "I'm all in favor of folks going to church, Heaven knows we need the prayer!" She promised to look into the local issue of street parking as well as the many other red curb, left-turn, debris-in-the-street, misplaced-transit-stops local issues that help the focus of the attending representatives. There were a couple of speakers who went a bit more global, such as August Steurer, PLUM Chair from Woodland Hills Warner Center, who pointed out that as the community works so hard to address land use issues, it's tough to advise on Planning and Development if the local community doesn't know what's going on with Transportation. He urged the department to join with Planning in early notification of local work and projects so that they can be integrated. The event was initially billed as a Neighborhood Council "Valley Training Day" but somewhere along the line, it shifted into a Town Hall meeting. Councilmembers Richard Alarcon, Wendy Greuel and Dennis Zine opened the session, all professing their love for Neighborhood Councils and all managing to lay down a foundation of "budget crisis" along with a dose of "lower your expectations, 'cause we're out of money." Councilman Alarcon spoke of the Council File Motion and expressed his commitment to working with Neighborhood Councils to make sure that it became a viable mechanism for NC involvement in City Government. Councilwoman Greuel informed the attendees that Angelinos spend an average of 93 hours a year in traffic, forgetting that this same crowd probably spends an average of 94 hours a year listening to reports on traffic, all while waiting for a couple of minutes at the microphone. Councilman Zine spoke of his world travels, admonishing the crowd to lower their expectations. "I've traveled all over the world and, in comparison, it's not so bad here!" Commissioner Al Abrams, Isaias Cantu of the City Clerk's office and Vivian Swanigan of the City Attorney's office all took a turn at the carefully choreographed and well-timed session, complete with "Wrap it Up" cue cards and featuring Gong-Show enforcement, delivering what could be best described as a living bulletin full of announcements. Damien Newton from StreetsblogLA writes of a group in Portugal who install pedestrian crosswalks made up of the names of those pedestrians who have died crossing the street. The artistically designed memorials include the tag, "1/4 of car accident victims are pedestrians." Here is Los Angeles, we also have a mechanism for memorializing those who have died in an attempt to simply cross the street. While not quite so dramatic as the ZebraStripe crossings in Portugal, the Los Angeles memorials serve as a constant reminder that our streets are dangerous and that crossing them is risky business. Los Angeles names buildings and freeways after civic leaders and local heroes but crosswalks are reserved for the children who die trying to cross the street. Hardly the mark of a Great City. 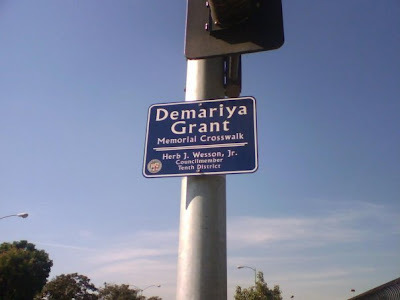 The "Demariya Grant Memorial Crosswalk," on Rodeo Road between Rodeo Lane and Farmdale Avenue near Dorsey High School, was dedicated in memory of nine year old Demariya Grant who was struck down and killed by a hit and run driver in December 2005. The "Jason Quarker Memorial Crosswalk" at 6th and Jefferson honors Jason Quarker, who was struck and killed while crossing Jefferson on his way to the 6th Avenue Elementary School. Meanwhile, LAist draws attention to the machinations of the Los Angeles Department of Transportation as they contemplate the removal of the crosswalk at the corner of Magnolia and Blakeslee. 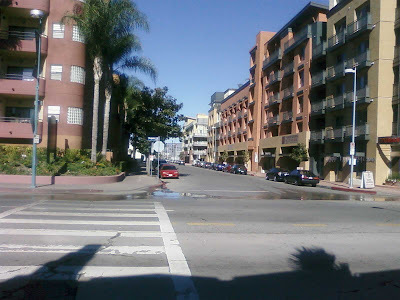 The crosswalk falls halfway between Lankershim Blvd. and Vineland Ave. 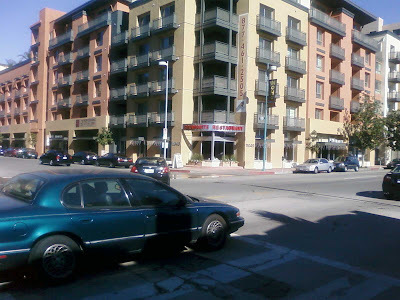 The Intersection has significant housing on the north side of Magnolia and on the other side of the street are abundant amenities ranging from local theatres to restaurants to shops to a local church which meets in one of the theatres. 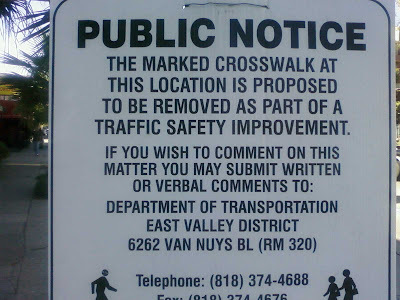 It would seem that the intersection of Blakeslee would be an ideal location for a crosswalk but the LADOT has posted signs indicating that "the marked crosswalk at this location is proposed to be removed as part of a traffic safety improvement." 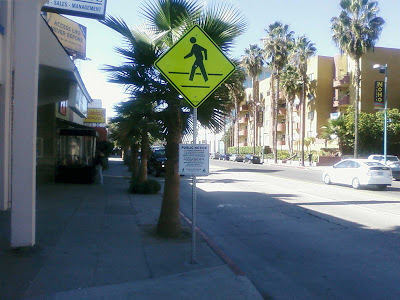 A call to the posted number at the LADOT yielded an explanation for the proposed crosswalk removal consisting of "The crosswalk is being reviewed in order to determine if it meets the state and federal guidelines." Hmmm! "Traffic Safety Improvements" and "State & Federal guidelines" sound like worthy motivations until you factor in the proposed action: they're proposing to remove a crosswalk! John Fisher, Assistant General Manager of the LADOT explained that they did a study a several years ago and they reviewed 7 years of data, determining that the removal of crosswalks resulted in a 61% reduction in pedestrian collisions. 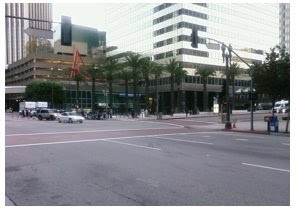 As a result, the department routinely looks at the crosswalks in Los Angeles and evaluates them for removal. Fisher adds, "Of course, if this location is an activity center, then this would be taken into consideration as we evaluate the crosswalk, the flow of traffic and the volume, the pedestrian activity and the community response." This particular street was recently featured in the LATimes in an article that detailed the community's response to the increase in parking meter rates along with the extended hours of operation. Critics charge that the LADOT acted without public input or notification and that effect on the community was negative. Now this? Nancy Bianconi of the NoHo Arts District was shocked to find out that the LADOT was considering the removal of the crosswalk, exclaiming "If anything we need a smart crosswalk, one complemented by lights and traffic calming that supports the vibrant streetlife that we are working to create in the NoHo Arts District." Linda Fulton, owner of the Avery Schreiber Theatre, points out that the city has made a lot of money off that crosswalk, writing tickets to motorists who don't yield to the pedestrians. 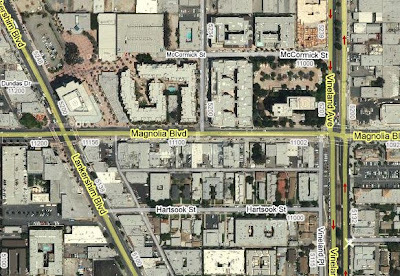 "There are 7 theatres between Lankershim and Magnolia, there is lots of mixed-use development on Magnolia, all drawing pedestrians to this community, and we need to support the pedestrians, not abandon them in favor of improving the flow of traffic." On the south side of Magnolia there are shops, 7 theatres, restaurants and other attractive signs of streetlife. It seems like the least the LADOT could do is to support those who simply want to cross the street. This is the sign the LADOT posted on both sides of Magnolia, soliciting comments on a process that isn't explained. A phone call to the number is answered by a woman who says "I can't answer questions, I only take down comments." The intersection of 5th and Flower is just like any other downtown LA intersection in that it is designed to move large quantities of vehicles rapidly and efficiently. It is especially successful in this endeavor with seven lanes of one-way traffic moving east on 5th and six lanes of one-traffic moving south on Flower. This intersection is also home to the Central Library, to the Bonaventure Hotel and two huge office buildings, all generating heavy pedestrian activity which is at odds with the movement of the vehicles. The problem is that this intersection is designed to simply move either vehicles or people, with the success of one group coming at the expense of the other. Eastbound vehicles stack seven and eight deep in the left turn, waiting for the pedestrians to clear the intersection. Pedestrians enjoy a four-second "Walk" phase as they set out to cross six lanes of street, all with vehicles edging forward into the crosswalk. The tragic death of Gwendolyn Coleman last week after she was hit in the crosswalk by a DASH bus only dramatizes the intense conflict at 5th and Flower. As a community, our first responsibility is to work together to protect our most vulnerable. When pedestrians and motorists are left to compete for space, pedestrians will lose every time. Unfortunately, for most, the loss is their lives. Last week the Urban Design Studio, led by Emily Gabel-Luddy, went before the Planning Commission with a bold and comprehensive proposal that would dramatically improve pedestrian life in downtown Los Angeles. Consisting of new Architectural Design Standards and new Street Standards, that work together to balance the needs of the different user groups, the plan was endorsed by the Planning Commission and now goes to the City Council. We now have an opportunity to put people first and it starts with calling on our City Council and demanding a walkable city. We now have an opportunity to honor Gwendolyn Coleman and it starts with calling on the LA Department of Transportation and demanding a pedestrian-oriented intersection at 5th and Flower. We now have the opportunity to change our own lives and our communities and it starts by simply going for a walk. The City Council's Transportation Committee put the brakes on the LADOT's proposed West Valley speed limit increases, directing the LADOT to allow the Woodland Hills Warner Center Neighborhood Council (WHWCNC) the opportunity to weigh in on the Corbin Ave., Fallbrook Ave., and Mulholland Drive surveys. Public opposition to the five proposed speed limit increases included several different objections but it was the simple complaint of flawed civic engagement, of ineffective outreach, of a year long journey without public participation that resonated most. The Committee resolved the issue by deferring City Council action until after the community and the LADOT take the proposals to the public. Of the five speed limit increase proposals on the agenda, two of them, Saticoy Street and White Oak Avenue, were not affected by the Committee's ruling. They stand approved and there will be no additional public presentation or hearing before they go to the City Council for final approval. At issue is the routine maintenance or recertification of the speed limits on the City's streets that are certified for radar or lasar speed limit enforcement. There are approximately 700 street segments in the City that are certified for radar or lasar and each year approximately 100 of them come up for recertification. Of those 100 speed limit surveys, approximately 20 resulted in recommendations of an increase in speed limit so that the prevailing speed might better match the speed limit. This process is in accordance with the State's 85% rule, aka the "speed trap" law, which calls for the setting the speed limit so that 85% of the motorists are considered driving at legal speed, which then allows the LAPD to enforce the speed limit with radar or laser. Or as the LADOT's Principal Engineer, Allen Willis, puts it: "In other words, the public gets to vote on the speed limit with their gas pedals." Arguments against the process include calls to explore street calming techniques so that the prevailing speed matches the speed limit. Instead of raising the speed limit, for example, using tools such as speed humps, speed tables, road diets, lane reconfiguration, signal positioning and signal timing, that would make the streets more accessible to other modes of travel, such as pedestrians and cyclists. Dr. Thompson, the Mandeville Canyon motorist accused of road rage, appeared in court for his arraignment on an amended felony complaint and now stands charged with a total of 7 counts. Thompson will return to court on February 23, 2009 when his attorney, Peter Swarth, is expected to enter a motion to dismiss the charges which are: 2 counts of assault with a deadly weapon, 2 counts of battery with serious bodily injury, reckless driving, reckless driving causing specified injury and mayhem. Deputy District Attorney Mary Stone moved swiftly, entering the charges and asking the Judge to order Thompson to surrender his passport. The Judge set bail at $100 thousand and directed Thompson to turn over his passport, giving him until Tuesday to retrieve it from storage. As in the past, Thompson appeared in court with his entourage, a group that only served to draw attention in an otherwise quiet and routine day at the La Cienega Airport Courthouse. The trial date is set for March 6, 2010, almost 2 years after the July 4 weekend incident that set this journey in motion. Thompson is alleged to have pulled his car in front of 2 cyclists, slamming on his brakes, causing one cyclist to hit the ground while the other cyclist went through the rear window. The incident drew attention from around the world to Mandeville Canyon, not just because of the motorist vs. cyclist tension demonstrated in this incident but also because of the history of conflict in this exclusive community. Residents complain of speeding motorists, motorists complain of slow cyclists, speed humps irritate the upper Mandevillians, honking irritates the lower Mandevillians, trash cans create an obstacle course for everybody and, through it all, Councilman Bill Rosendahl has convened a task force to see if there's a way for everybody to get a piece of the road. 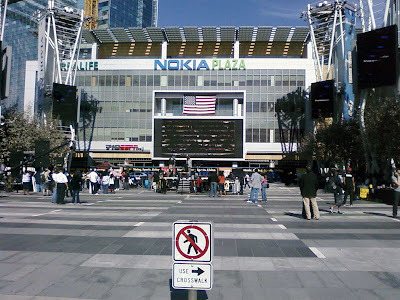 CityWatchLA - LADOT Appears Ready for an Agreement with NCs - Are they up to getting it done? Fresh on the heels of last weeks City Council brouhaha over the Department of Transportation's failure to conduct appropriate community outreach, the DOT has … surprise … stepped up and announced that it is developing a Memorandum of Understanding "to be signed by the Department and willing neighborhood councils." While the DOT's willingness to enter into a relationship with the neighborhood councils is to be applauded, there is no better time than now to point out that the best place to start is not a rehash of an old document designed to accommodate a different concept but at the beginning. The email that went out on Friday to the City Council offices and NC Chairs contained a "Draft MOU" and instructions on how to email suggestions and comments. It appears the DOT has already begun and it's up to the public to catch up. It also appears that they want to negotiate the agreement by email and public hearings as opposed to at the table where the DWP MOU and the Planning/NC Pilot Program were created as partnership projects. Neighborhood Councils have had both good and bad experiences developing MOU's and it would be a shame not to learn from the past. Best practices include having a neutral moderator facilitate the process and to start by having representatives from both parties come together to hammer out a framework of an MOU as a starting point. It's important here to acknowledge the DOT's willingness to engage but to also point out that this is a significant step. It's not simply a curb cut or a crosswalk with a 60-day period for public comment and then DOT authority to continue on the journey. This is a document that memorializes and codifies a relationship and the mechanism for communicating and working together. It's a living breathing document with opportunities for revision and adjustment, just like any good relationship. That is why we must be in on the process from the beginning, not as spectators, not as passive witnesses, not as “inputers,” but as equal participants in the development of a relationship. It's been three years since the USC research folks, headed by Dr. Terry Cooper, facilitated the original DOT/NC MOU. The one that had so much trouble finding favor with Gloria Jeff, who managed the department at the time. And it has been months since the Neighborhoods and Education Committee last called on current GM Rita Robinson to develop a report on the development of an MOU. Through it all, Neighborhood Council leaders have been clamoring and lobbying for an MOU. It’s refreshing and encouraging to see movement from the Department, but this is an important agreement and it will influence an important relationship for some time into the future. It needs to be done right. Robinson and her liaison need to sit with people outside of the halls of the city to get a clearer and more objective perspective on the best way to make this important MOU happen. The sign reads: A woman’s life ended here today and many will be changed. God bless her and her family. Let’s all slow down a little here in downtown. Time in the cross walk ran out for Gwendolyn Coleman last week. On Wednesday, January 7th, at 6:30 in the morning, Gwendolyn Coleman stepped into the crosswalk at 5th and Flower Downtown LA and started to cross the street. She never made it. She was hit by a DASH bus and killed. The LAPD later reported that the woman had been crossing the street legally and that the DASH operator did not see the woman because of a blind spot. The circumstances of this tragic incident are shocking and have resonated not just through the downtown area, as is evidenced by the spontaneous memorial, but throughout the city. Discussions broke out on the danger of LA's streets and the difficulty a pedestrian has in competing with vehicular traffic for the simple right cross the street safely. This particular intersection is especially tough for pedestrians. The first of the three phases, the "Walk" phase, is only 4 seconds long. There are six lanes to cross and the "Walk" phase is only sufficient for a healthy adult to get to the second lane before the blinking red hand appears. The debate over signal timing, along with arguments over the speed of motor vehicle traffic on streets with significant pedestrian activity, have long been a point of contention and this intersection is a sad but excellent example of a bias toward moving cars at the expense of the safety and convenience of pedestrians. The City Planning Commission has just unanimously approved a proposal to make Downtown Los Angeles more walkable and pedestrian-friendly. The proposal has been in the works for two years and consists of two parts, an Urban Design Standards and Guidelines element and a Downtown Street Standards element. While this significant step is much too late for Ms. Coleman, it's not too late to honor her by working together to make LA a better … and safer … place for pedestrians. Meanwhile, the Department of Transportation is appearing before Wednesday's Transportation Committee meeting with proposals to raise the speed limits at several locations throughout the Valley. There's no better time than the present for LA’s citizens, the LADOT and City Planning to begin working together at leveling the safety playing field for those who cross the City’s many crosswalks on foot. 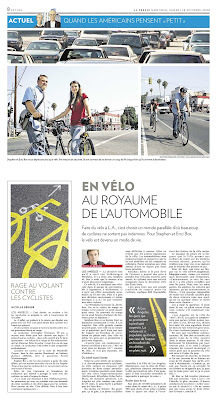 "To travel by bicycle in Los Angeles is to choose a parallel world" writes Nicolas Bérubé for Montreal's La Presse, demonstrating, once again, that what happens in Los Angeles resonates throughout the world. I don't speak French but I know Katie and she was gracious enough to translate the article for us. To travel by bicycle in Los Angeles is to choose a parallel world in which many cyclists don't leave unscathed. For Stephen and Enci Box, cycling has become a way of life. PHOTO CAPTION: Stephen and Enci Box only travel by bicycle. As an added safety measure, they always call each other each time they arrive at their destination. The last time he left in his Volkswagen Westfali, two years ago, Stephen M. Box sensed that the motor would not last for long. That night, he parked his car in the garage of his apartment building, in Hollywood. He left his accumulated personal belongings which had gathered there over a number of years. And he made a surprising and even heroic decision for Los Angeles: He decided not to buy another car. "The Westfalia is sitll there," says Mr. Box. "We go to visit it from time to time. It's like a little museum for us. A souvenir of a time when one needed to buy gas in order to get around." Stephen Box and his wife Enci travel through the city by bicycle now. In Los Angeles. A city as large as some small countries. A city where driving is so popular that it's not uncommon to find oneself in a traffic jam in the middle of the night. A city where people who travel on foot are suspect. "The other day, a driver lowered his window to shout at me, "Hey, you aren't in Europe, you know!" recounts Mr. Box. "I didn't respond. You get used to it." According to the weather charts of the region, Los Angeles should promote cycling. The city counts 329 years of sunshine annually on average. Certain neighborhoods are located on monumental hills (Hollywood, Silverlake, Echo Park). But in general, the city is flat as a coin and as easy to pedal through as the Netherlands. In theory, at least. In practice, it's rotten. The bikable streets are hard to find. They don't take you to the busiest parts of the city. Drivers are always speeding and, until the law was changed this past summer, always on the phone. Paying attention to cyclists on the roads around them doesn't factor in to their priorities. The result: Even as the rising price of gas pushes more people to travel by bicycle more often, cycling remains a marginal activity in the second-largest city in the United States. "People don't have a great tradition of respect for cyclists," explains Bill Rosendahl, Los Angeles City Councilmember. "Now, with the energy crisis, more and more citizens are choosing to travel by bike. This is why we have to work together to learn to share the road." With more than 10,000 kilometers of roads in Los Angeles County, less than 700 are given bike routes, of which a quarter are outside the limits of the most highly trafficked areas of the city. The lack of bike routes is so pronounced that the City allows cyclists to ride on the sidewalks, often deserted, provided that cyclists don't ride too quickly or put the safety of pedestrians at risk. For Mr. Box, who maintains a blog about biking (www.soapboxla.blogspot.com), even these disappointing statistics are misleading. "Strangely, it's the streets with bike lanes that are the worst. You have parked cars, buses, cars leaving parking spaces ... It's almost impossible to ride in the lane for more than two minutes without somebody or something getting in your way." He settles the matter: He rides in the street, in the center of the lane, as if he were driving a car. "Los Angeles is the city of 'me,'" he says. "People don't understand that a cyclist can ride in the street, in front of them, in front of their car. They look at you with their arms raised, their eyes large. They just refuse to see it." In his community work, Mr. Box must travel to all four corners of the city, often in the same day. He says he easily rides 50 kilometers every day, often more. He goes to each Municiple City Council meeting and fights for each bicycle issue to be put on the agenda. As a measure of security, his wife and he began to call each other each time they reached their destination. "That way, we each know the other has arrived safely. If she doesn't call me, I know go out on the road to make sure everything's okay with her." Mr. Box is insulted, several times a week, by drivers on the road. "Get a car!" is a common one lately. Other drivers cry out, "Get on the sidewalk!" "They don't know that I have the right to be on the road," he concludes. Last summer, an incident occurred that propelled cycling into the forefront of the news. On July 4th, a retired doctor drove down a steep hill in his SUV, passed two cyclists in the road in front of him, and slammed on his brakes without warning. One cyclist went through his rear windshield and suffered serious injuries to the face and head. The driver, Christopher Thompson, 59, was reported as saying that he slowed down as he did in order to "give them a lesson." He claims that the cyclists -- two athletes in their forties -- refused to ride single file, even after he honked his horn. According to the police, it was a case of road rage. The driver was arrested and will soon appear in court. The accident took place on Mandeville Canyon Road in the fashionable Brentwood neighborhood, home to several celebrities as well as California State Governor Arnold Schwartzenegger. Stephen Box was one of the first people to comment on the incident, a story that continues to be followed by the LA Times and which all cyclists in Los Angeles recount as a tale of terror. According to him, it's the ignorance and impatience of the driver, unused to sharing the road with cyclists, that was the cause of this debacle. "We have a lot of educating to do. Unfortunately, the generations before us didn't demand bike lanes and equal rights for cyclists. We have a long way to go. It's difficult. But we have to start somewhere." The best argument for an MOU (Memorandum of Understanding) between the Department of Transportation and the Neighborhood Councils was made by none other than the LADOT's Assistant Manager, Amir Sedadi, when he went before the City Council in the opening session of the new year to discuss the City's controversial parking meter rate increases and stubbornly insisted that the LADOT was not responsible for communicating with the public. Sedadi was taken to task by several Councilmembers for the LADOT's failure to conduct outreach to the community as the Department implemented the recent parking rate increases, adjusted the hours of operation and installed the new parking pay stations, all of which have stirred discontent and complaints throughout the city. Sedadi was at first resolute when Councilwoman Janice Hahn and then Councilman Tom Labonge took him to task for failing to conduct adequate outreach, claiming that the outreach was good, "Given our resources!" Then Councilman Dennis Zine got into the action: "Let me ask you a simple question. Did you communicate with the Chambers of Commerce, the Neighborhood Councils and the community groups in the affected areas?" Sedadi tried to give a non-answer saying "We communicated with the Council Offices." Zine repeated the question again and then again before Sedadi acknowledged that the LADOT did not communicate with the public because they simply don't have the resources and because their plan is to work with the Council District offices who, he said, “We depend on to deal with the public." This is a popular response that seems to be the party line and the LADOT is to be commended for its message control. From the Transportation Commission to the district office, from General Manager Rita Robinson to the local traffic engineer, over and over the public hears that the LADOT communicates with the Council offices and it is up to the Council office to communicate with the public. Zine wasn't buying it. He pointed out that if that was the case, why didn't he know more about the new parking meter plan and the new parking rates and the new hours. Zine asked who in his office had Sedadi worked with on this plan. Sedadi had no answer. As the discussion continued Zine went to work and within a few moments, Cliff Ruff, Zine's Chief of Staff appeared in chambers with a document in his hands. Short on pages and apparently unimpressive. Zine glanced through it and stood to his feet … passion accelerating … "If this is the plan, then your outreach is a failure!" Sedadi sank back in his chair but recovered quickly, offering up what appeared to be a heartfelt apology. "On behalf of myself and on behalf of Rita Robinson, I'd like to apologize to the Council for our failure to conduct effective outreach." Wow! An apology from the LADOT! He quickly got back on the offensive and told the Council the problem was their fault. “You told us what to do. You gave us 90 days in which to do it. You never told us to talk to the public! Why, some of those groups want to vote on things!" On the hot seat, under attack from the City Council for not conducting outreach to the Neighborhood Councils, the Assistant General Manager of the Department of Transportation opens with an apology and then closes by chastising the Council for expecting the DOT to talk to the public. Lack of outreach to NCs is not new to this group. The Department of Transportation's long-standing apparent contempt for the Neighborhood Councils was evident when GM Rita Robinson visited the LANNC a few months ago and offered a tepid endorsement for communication while she gave feeble excuses for not implementing an MOU. Earlier she turned up in the Education and Neighborhoods Committee in response to a request for a report on the MOU and turned in a report that failed to mention...you guessed it...the MOU. It continued when the 60 day deadline for a new report came and went and she failed to respond to the same committee request for a report on an MOU. At the end of the day, Councilman Ed Reyes is to be commended for responding to the complaints of his constituents, many of whom were local merchants concerned about losing customers and Councilmembers Hahn, LaBonge and Zine deserve credit for stepping up and asking LADOT the hard questions including "Have you spoken to the Neighborhood Councils?" Neighborhood councils have also complained about not being given the opportunity to provide input on proposed speed limit increases in their communities. In trying to resolve her outreach issues with NCs, Robinson has spent a fair amount of time looking for help from other departments. There are those who feel that LADOT’s GM would be better served by starting with a reading of the City Charter’s Article IX. The part about neighborhood councils being created to provide City Hall with advice. And needing to have sufficient advance warning that they can measure the voices in their neighborhoods before they formulate that advice. The Charter mandates that responsibility to neighborhood councils. It’s the law. The time has come for a second civil rights movement for cyclists. It’s time to build on the work of Albert Pope and the 1880s generation of cyclists. It’s time to press for a Cyclists’ Bill of Rights. 3. Cyclists have the right to equal access to insurance protection. 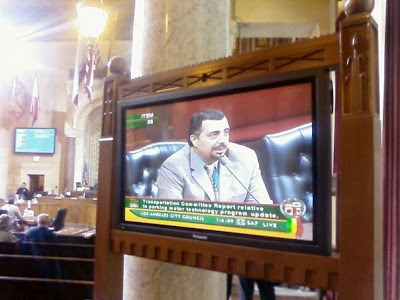 Two weeks ago, my call for a Cyclists’ Bill of Rights became reality, when the Los Angeles City Council voted to approve a Cyclist’s Bill of Rights. That approval is apparently preliminary; as recommended by the Transportation Committee and approved by the City Council, the Cyclists’ Bill of Rights will be forwarded to the Los Angeles Department of Transportation, Planning Department, Department of Public Works, and Los Angeles Bicycle Advisory Committee, in consultation with the City Attorney and the Los Angeles Police Department, to report with recommendations on how to incorporate the principles enshrined in the " Cyclists' Bill of Rights" into the City of Los Angeles Bicycle Master Plan and other relevant documents and practices. As the Council considered the motion to adopt the Cyclists’ Bill of Rights, Councilmember Tom LaBonge expressed some concern that a provision in the Cyclists’ Bill of Rights — the one stating that "Cyclists have the right to the full support of educated law enforcement” — might offend the police by implying that they are uneducated. Councilmember LaBonge is also concerned that while the Cyclists’ Bill of Rights addresses the rights of cyclists, it says nothing about their responsibilities, a “flaw” also found in the United States Bill of Rights. That’s how Bills of Rights work. Because Councilmember LaBonge is vice-chair of the Transportation Committee, and chair of the Parks Committee, both of which will consider the Cyclists Bill of Rights before it is returned to the City Council for final approval, he will have an opportunity to edit the Cyclists’ Bill of Rights it’s returned to the City Council for final passage. It remains to be seen, therefore, what the final text of the Cyclists’ Bill of Rights will be when it comes before the City Council for final approval and incorporation into the Los Angeles Bicycle Master Plan. Nevertheless, the City Council’s preliminary approval is an important step forward for cyclists’ rights. And that raises the question — how did my proposal for a Cyclists’ Bill of Rights end up before the Los Angeles City Council? The truth is, it didn’t. While I was busy writing Bicycling & the Law, and reaching the conclusion that we need a Cyclists’ Bill of Rights, Los Angeles cycling activist Stephen Box arrived reached the same conclusion independently. Box and his wife Enci organized the first meeting of the Bike Writers Collective in January of 2007, at which Box presented his idea for a Cyclists’ Bill of Rights. The Bike Writers Collective enthusiastically accepted the proposal, and began working on a draft, eventually coming up with the Cyclist’s Bill of Rights — a document which independently arrives at several of the same themes I outlined in Bicycling & the Law. Bike Writer Collective member Mikey Wally presented the first public draft of the Cyclists Bill of Rights to the Los Angeles Bicycle Advisory Committee on February 5, 2008. By March 17, the Cyclists Bill of Rights had been endorsed by the East Hollywood Neighborhood Council. The Cyclists’ Bill of Rights was next endorsed by the Silver Lake Neighborhood Council. That endorsement came on July 1; three days later, on July 4, Dr. Christopher Thompson used his car to attack cyclists Ron Peterson and Christian Stoehr on Mandeville Canyon Road. This incident was the catalyst that prompted Los Angeles City Councilmember Bill Rosendahl, to begin advocating for the Cyclists’ Bill of Rights. For several months Rosendahl worked to gain support for the idea; his hard work reached fruition on December 9, when he introduced a motion to adopt the Cyclists’ Bill of Rights, and the Los Angeles City Council voted to approve that motion. It remains to be seen what final form the Cyclists’ Bill of Rights will take in Los Angeles. Councilmember LaBonge will be in a position to make changes that address his concerns before final approval. Stephen Box is determined to have it included in the new Bicycle Master Plan “as written, as ridden.” The battle isn’t over yet, and now is the time to get involved. Still, I can’t think of better news to end the year on.